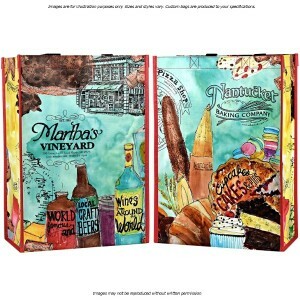 Whether purchased in small quantities of 100, or fully customized and ordered by the thousands, custom laminated bags are popular items around here! The smooth, shiny feel of the material combines with bright logos and bold colors appeal to a wide range of marketers and retail stores alike (check out our client’s bag to the left!). Plus, since lamination is slick, it’s easier to clean that an uncoated bag made from the same material (simply wipe it down with a wet cloth or disinfectant spray). Our custom laminated bags are made using woven polypropylene, nonwoven polypropylene, or recycled PET and come in many different sizes, colors, and materials. This is great for the purpose of making your logo pop for a reusable bag project, but what happens after you give the bag away? Likely, they are reused, perhaps as a grocery bag. After all, the laminated coating allows the rectangular bag to better maintain its shape, which enables easier packing at checkout. Donate them to your local food pantry or homeless shelter. We donate bags (and water bottles from Bulletin Bottle) to our local shelter every month. These are luxury items to many people, who use them for shopping, but also for toting their belongings with dignity. The laminated outer coating protects from wet, dirty conditions a little better also! Use them to haul library books to and fro. ‘Nuff said. Give them to your children to bring to and from school. They’re perfect for wet snow gear and muddy rain boots. Give your unwanted laminated bags to farmer’s market vendors. They, and their customers, will appreciate having some laminated bags on hand for their wares. Use them as beach or pool bags. Just make sure to turn them inside out to dry them completely. So…what do you use your custom laminated bags for (besides shopping)? We’d love to hear your great ideas!